Food almost always sets the tone for an event; at least in my world it has played that role. If Matar Makhane was on the menu for a meal, we knew it was a happy occasion, either a gathering of friends or an indulgence for the family to celebrate a happy occurrence. 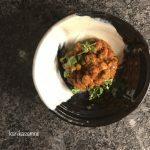 In the last few years of living away from India, I have often craved for Matar Makhane. The first time I cooked them for myself, I asked my mom what to do. 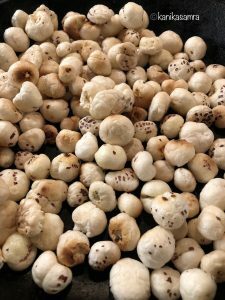 One brilliant suggestion that she gave me was to toast makhane instead of frying them – for that’s the common method of cooking Lotus seeds before adding them to a tomato based gravy. Needless to say, I’ve stuck to that recommendation. As I think about the food I cook, share and write about, I realize more and more how she influenced it in her life and continues to do so now after her passing. This is also a testament to the fact that the food we grow up eating shapes a lot of what we do as adults, impacting every cuisine we adopt as our own. After those musings, time for some information about the cultivation of makhana. A news story from 2014 states that government of India has been keen on promoting cultivation of a variety called ‘Swarnavaidehi’ developed by the Indian Council of Agricultural Research. Bihar – a state in eastern India, is the epicenter of the world’s Fox Nut/ Gorgon Nut production. 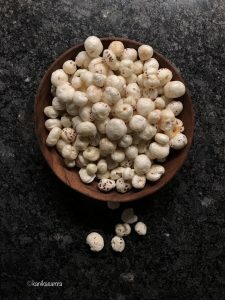 While called Lotus Seeds, the Fox Nut plant is a separate aquatic plant from the same family as the lotus. It has a bulbous flower that ultimately produces seeds which become puffy Makhane. Without further adieu here’s my recipe that will make you love Matar Makhane as much as I do. To roast the nuts, put a heavy bottom pan on medium high heat. Add 1 tbsp of oil and tip in all the makhane that you are using. Gently toss and turn to roast until they start browning. Take off the heat and keep in a bowl while you cook the gravy. Watch the video below for my time roasting makhane. Two things need to be done before we get cooking. First to soak poppy seeds in lukewarm water. For 1 tablespoon poppy seeds use about 1/4 cup water. Let these sit while cooking a base for the gravy. Second, to soak green peas in warm water. I used frozen peas. Just soaking at this time is enough because they will cook for a few minutes in the gravy later. Chop and slice garlic, ginger and onion. Then, in a pan or wok that you will finally use for assembling all ingredients, heat a tablespoon of oil. To this add garlic, ginger and onion. Cook until onion slices start caramelizing. Then remove from heat and let this cool down for a few minutes. Once the onions have cooled and are about lukewarm, transfer to a food processor. To this add poppy seeds and pulse, adding water as needed to make a thick paste like puree. The poppy seeds might not blend entirely and that is fine. They are edible! 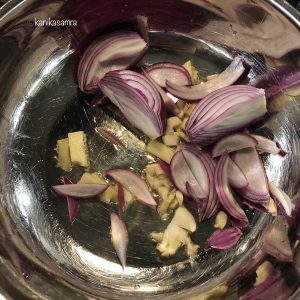 Cooking onion, garlic and ginger. Onion and poppy puree with tomato paste. Heat up the same wok that was just used and transfer the puree to it. 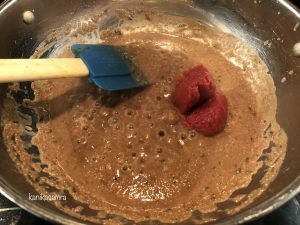 To this add 2 tablespoons of tomato paste. I used canned tomato paste, but, you could just as easily use fresh tomatoes. Bear in mind that fresh tomatoes will require a longer cooking time. Once, the sauce has cooked and leaves the sides of the wok, add about 1/2 cup water. Add all salt, pepper and other spices to the thick paste. Cook for a few minutes. To finish, drain water from the peas and transfer to the gravy along with toasted makhane. Cook together for 5-6 minutes until makhane absorb moisture and the gravy thickens. Turn off the heat and plate. Matar Makhane is ready. Garnish with fresh coriander and enjoy with warm paranthas or chapattis. 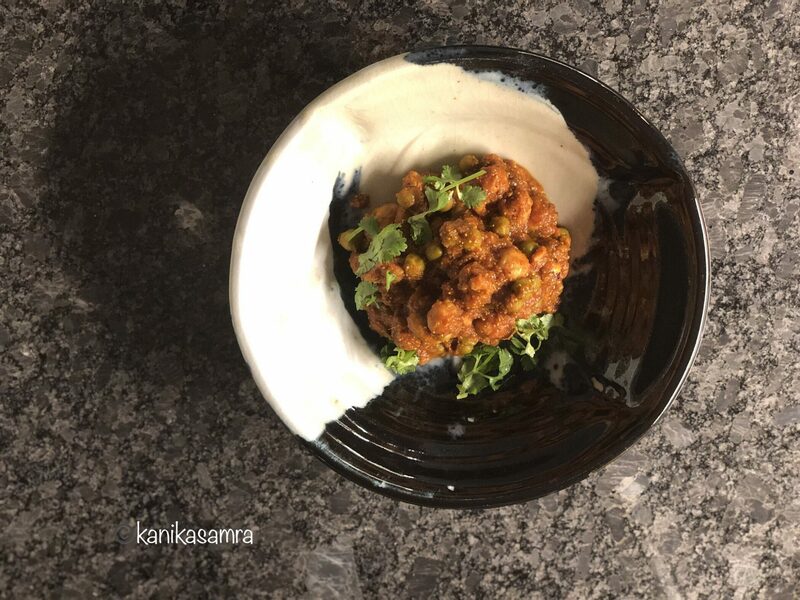 Matar Makhane or Puffed Lotus Seeds with Green Peas is an indulgent dish that is cooked for special occasions. Enjoy it with rice or warm rotis. Put a heavy bottom pan on medium high heat. Add 1 tbsp of oil and tip in all the makhane. Gently toss and turn to roast until they start browning. Take off the heat and keep in a bowl while you cook the gravy. First to soak poppy seeds in lukewarm water, for 1 tablespoon poppy seeds use about 1/4 cup water. Second soak green peas in warm water. In a pan or wok heat a tablespoon of oil. Add garlic, ginger and onion. 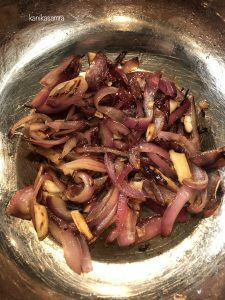 Cook until onion slices start caramelizing. Then remove from heat and let this cool down for a few minutes. Once the onions have cooled transfer to a food processor. To this add poppy seeds and pulse, adding water as needed to make a thick paste like puree. Heat up the same wok and transfer the puree to it. To this add 2 tablespoons of tomato paste. Once the sauce has cooked and leaves the sides of the wok, add about 1/2 cup water. Add salt, pepper and other spices to the thick paste. To finish, drain water from the peas and transfer to the gravy along with toasted makhane. Cook together for 5-6 minutes. Garnish with fresh coriander and enjoy with warm paranthas or chapattis. 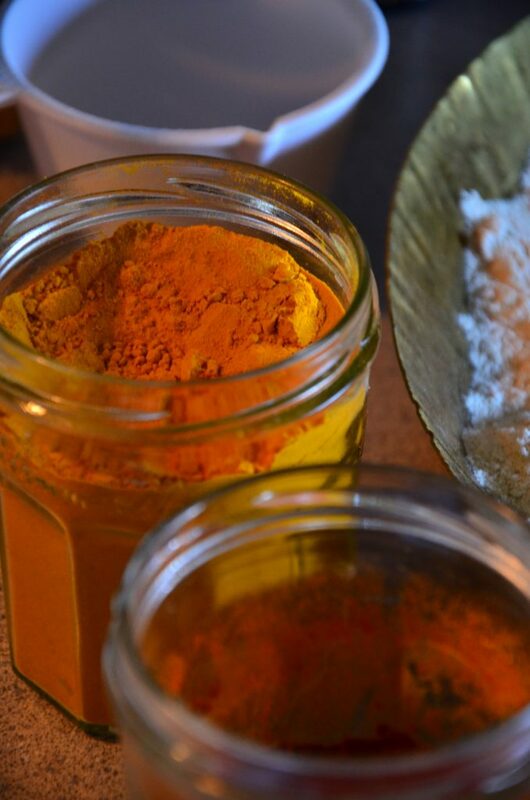 Very interesting recipe, I love this style of cooking with so many lovely spices!